AROUND 700 Hibs supporters have expressed a desire to back plans where fans can help buy shares in the club. 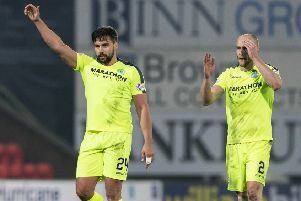 They have noted their interest on the website www.hiberniansupporters.co.uk after the newly-created company Hibernian Supporters Limited (HSL) was announced last week. The initiative could see fans hold a controlling stake in club as new shares are issued that would enable the holding company’s shareholding to be diluted below 50 per cent. Supporters who make contributions will not own shares directly but will own HSL, which in turn will own the shares in the club. Contributions can be made via a lump sum or on a monthly basis, with a anticipated contribution of £225 – or £18.75 per month – being sought.